Why See Happy Together Tour? The Happiest Concert In The US celebrates 10 YEARS on TOur! The Happy Together tour heads out once again to celebrate its 10th anniversary with the biggest line-up of 60s groups yet! Topping the bill are The Turtles, whose iconic 1967 number one hit 'Happy Together' gives this tour its name. 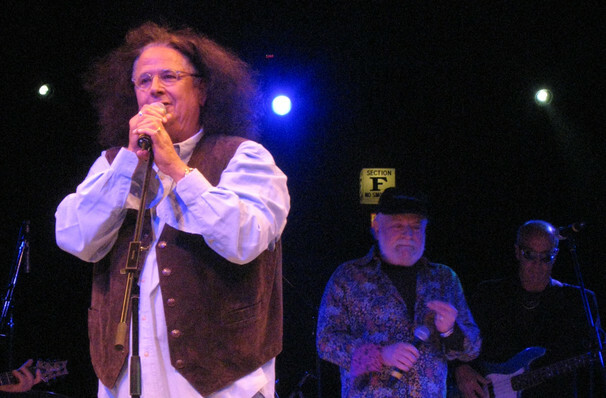 Led by vocalists Howard Kaylan and Mark Volman, their other best songs include 'She'd Rather Be With Me' and 'You Know What I Mean'. They're joined by other stalwarts of the decade such as The Association ('Along Comes Mary', 'Windy') and The Cowsills ('The Rain, The Park & Other Things'). 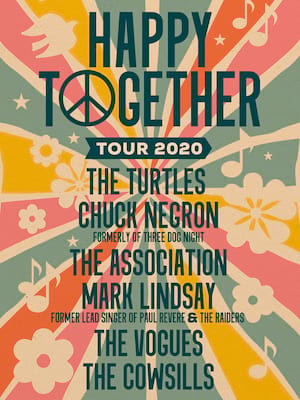 The complete line-up for the Happy Together Tour is The Turtles featuring Flo & Eddie, Chuck Negron formerly Of Three Dog Night, The Association, The Cowsills, the Buckinghams, the Classics IV, and Gary Puckett & The Union Gap. Sound good to you? Share this page on social media and let your friends know about Happy Together Tour at Paramount Theater. Please note: The term Paramount Theater and/or Happy Together Tour as well as all associated graphics, logos, and/or other trademarks, tradenames or copyrights are the property of the Paramount Theater and/or Happy Together Tour and are used herein for factual descriptive purposes only. We are in no way associated with or authorized by the Paramount Theater and/or Happy Together Tour and neither that entity nor any of its affiliates have licensed or endorsed us to sell tickets, goods and or services in conjunction with their events.